Unassumingly tucked away amongst the store-fronts in downtown Fairfield is Catch a Healthy Habit. Maybe you’ve not been in a while…maybe you’ve never been at all, or you’ve been curious, but you’ve never been. The Cafe has been in Fairfield for over six years and in New Haven for two years prior to opening in Fairfield. 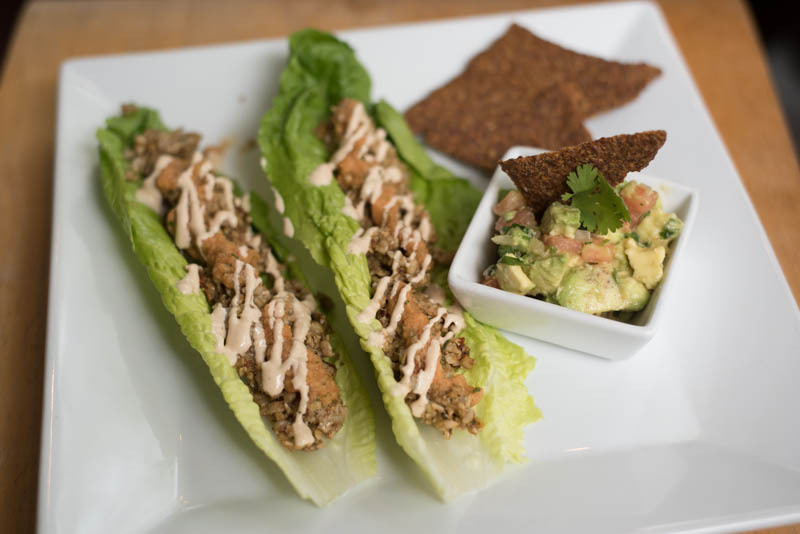 This casual, health-based, raw, gluten-free and vegan eatery focuses on clean eating. Their products are organic and non-GMO and the tastes and presentations are delicious and beautiful. They recently launched their new Spring/Summer menu and Stephanie Webster, armed with her camera, and I had the opportunity to stop in and sample some of the newest goodies to grace the menu. The food is gorgeously plated, visually stunning, allowing the naturally vibrant colors of spring to take center stage. As the weather heats up and we shed our outer layers we still need to satisfy our hunger without feeling weighted down. Perhaps you’re hankering for a smoothie or a green juice. With the temperature rising, as is the humidity, order up the Island Livin (bring a friend to share it with) and cool off instantly with this refreshing beverage that tastes a little bit like paradise. Beautifully presented in a shaved coconut bowl, the chilled smoothie-type beverage is simply mango and coconut water, icy and packed with nutrients and flavor, this will hit the spot on a hot day. Alice might have enjoyed The Magic Mushroom Elixir before she went down the rabbit hole - but hers wasn’t made from almond milk, cacao, Chaga and Reishi mushrooms, coconut oil, dates, cinnamon and water. This absolutely delicious thick, chocolaty beverage is served icy cold on a hot day, and hot in cooler weather. You really have to taste it to believe it! I was a skeptic…I think Stephanie was too, but do not let the mushrooms worry you. These two Asian mushrooms have long been known for their beneficial traits. Unlike Alice, you’ll not encounter Late Hares, Mad Hatters or Cheshire Cats…you’ll neither shrink or grow, but you will have one great cool, thick, frothy, chocolaty beverage! Maybe the Key Lime Pie is more your speed, made from almond milk, bananas, lime juice and zest, spinach, dates and vanilla, it is a force to be reckoned with. I assure you this will not disappoint. All the goodness of key lime pie in smoothie with none of the guilt. Does it get any better than that? Maybe it does…with the Funky Monkey Smoothie Bowl. Bowl automatically means, bring a friend and grab an extra spoon! 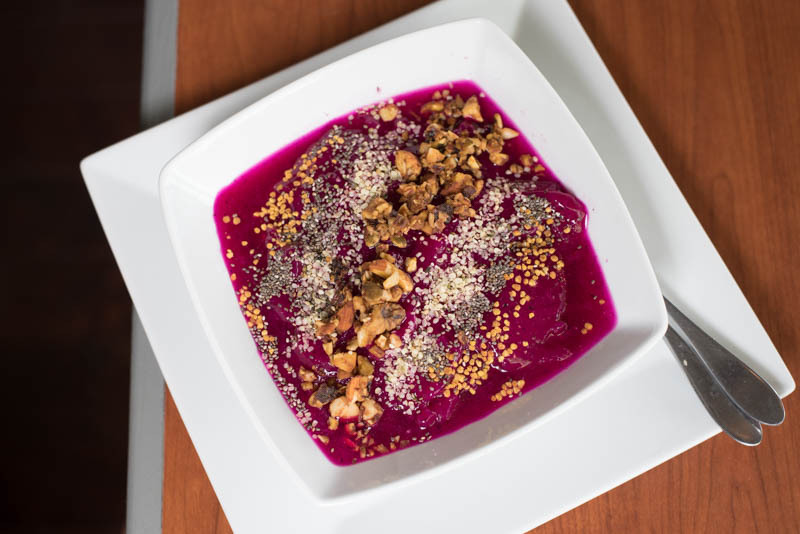 The Smoothie Bowl is a 16-ounce smoothie served in a bowl with three add-ins. When you order the Funky Monkey you really have no choice but to include some chocolate chips, brownie bites and cookie dough and suddenly this bowl is more decadent than a birthday cake, but since it’s made with almond milk, bananas, almond butter, spinach and dates you needn’t feel guilty.  Perfect, isn’t it? From the smooth, refreshing and somewhat decadent, you can move to the salads. The Tostadas (seen above) was one of the best things I have eaten in a long time. 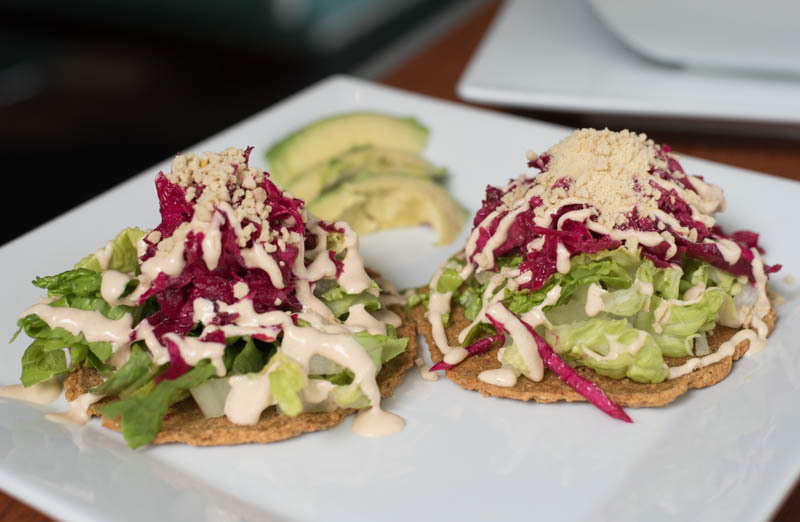 Served on a corn tostada, the shredded romaine lettuce pairs perfectly with a wonderfully pickled, marinated cabbage slaw that was accompanied by avocados, an incredibly flavored Chipotle ‘cream’ and topped with a cashew Parmesan cheese. Stephanie could not sing the praises of this enough - we gobbled every morsel, might have even licked the plate clean! The Tacos are another creative alternative…what we expected. Romaine shells are filled with a version of refried beans, Salsa Nacho, the wonderful chipotle cream and a side of chips and guac, which might have been one of the best I’ve had in a long time. You may want to order an extra side of guacamole with this. The Just Peachy Salad is like a little bit of a dance party in your mouth with its fiesta of flavors. Served over butter lettuce, ‘roasted’ peach sprouts, ‘Goat cheese’ scallions, beets and pumpkin seeds with a peach vinaigrette, this very generously sized salad is not only beautiful but has a depth of flavor that will please your palate and your appetite. I must admit, however, I was a little disappointed with the Dragon Fruit Bowl. Ours was served with chia, flax and nuts. While gloriously beautiful in its dazzling purple hue, the taste paled by comparison - it was neither sweet nor savory. Perhaps I would have enjoyed it more had we tried it with bananas, berries and peaches. If a smoothie or bowl isn’t sweet enough for you, I suggest the Cacao Hazelnut Crepes. You will completely forget these are vegan and raw … prepare to be blown away. 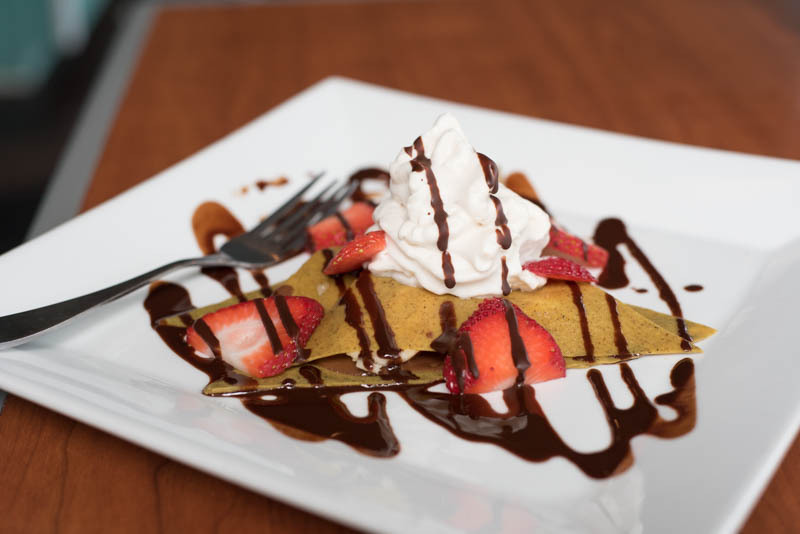 The walnut crepe offers a nice crunchy texture, different than what you might expect. Served with bananas, sliced strawberries, an incredibly decadent and chocolaty “Rawtella” and a whipped cream like no other - you’ll not believe it is dairy free and those who are lactose intolerant can rejoice, and lactose-lovers as myself can as well! It should be noted that neither Stephanie or myself are vegetarians or vegans, but I’m here to tell you that you should go. If you’re at all into healthy eating, you should go. If you’re into raw and uncooked, this should be at the top of your list. And if you’re not, do not let that dissuade you, because you will be more than very pleasantly surprised.